For full bibliography for 1960s,1980s, 1990s,follow links. Move on to 1976or back to 1974. 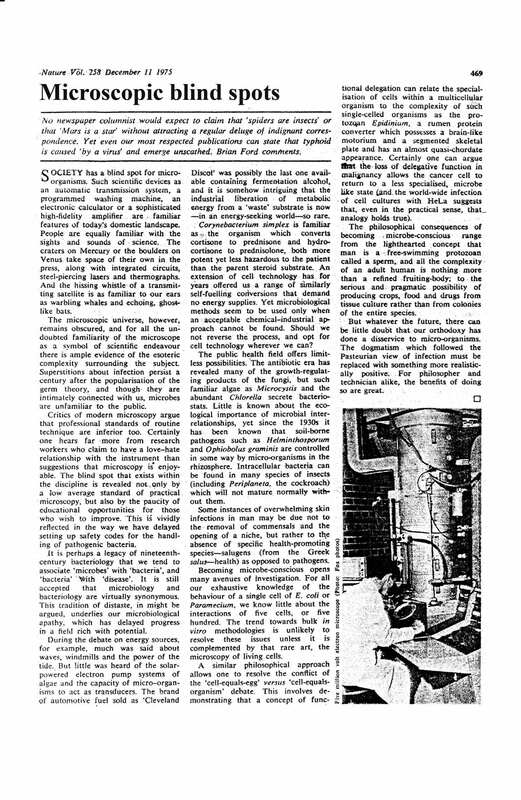 Anon, 1975, Review of Science Now, The Listener, 23January. Billing, 1975, Science Now [sample], Radio Times, 22February. Letter, 1975, Speaking of Science, Radio Times, 20 March. BJF, 1975, Reply: Selling Science Short, Radio Times,27 March. BJF, 1975, Whatever happened to Microscopy? [paper],Opening address to Inter Micro 75, King's College, Cambridge,23 June. BJF, 1975, Cancer Research: An Argument and a New Line of Enquiry,[published transcript], The Listener: 48, 10 July. BJF, 1975, Exporting Pollution [published transcript], TheListener, 18 September. Stevens, R. E., 1975, Report on Brian J Ford at Inter Micro75, The Microscope, 23: 275-276. McCrone, Walter, 1975, Review of Optical Microscope Manual,The Microscope 23: 286-288. Report, 1975, Indulging in Indulgence [preview of Alcoholismprogramme], Western Mail, 1 October. Billing, 1975, It's Your Line Special: Alcoholism [with picture],Radio Times [England edition], 5 November. Billing, 1975, It's Your Line Special: Alcoholism [with picture],Radio Times [Wales edition], 5 November. Anon, 1975, Review of Alcoholism programme, The Listener:651, 13 November. BJF (editor), 1975, Science Diary, 160pp, 10th editionfor 1976, London: Letts, December. Biography, 1975, BJF [in] The Blue Book - for notessee 1983 diary. BJF, 1975, The Fund, a film on Cancer Research, [documentarytranscript for Imperial Cancer Research Fund], produced and directedby Brian J Ford. BJF, 1975, Microscopic Blind Spots, [leading article for] Nature,258: 469, 11 December.